A 160 meters tall metal column is the main structural component of the i360 British Airways tower standing on the seafront opposite the skeleton of what’s left of Brighton’s West Pier. When completed in July the observation tower, designed by David Marks and Julia Barfield’s office, will offer spectacular views from the glass pod revolving around the column. The observation tower will be in sharp contrast with the city’s shabby chic architecture, so handsome but also neglected in many places. David Marks says he was unaware of the history of the West Pier, before he discovered the site in 2005. Now the tower, sponsored by British Airways, is meant to generate income for the restoration of the Pier, which has been deteriorating for the past ten years. On the ground level the seafront promenade has already been given an injection of energy with new shops and cafes opening under the arches. David Marks and Julia Barfield are world-known for high-tech concepts in urban design, most notably the London Eye. The husband-and-wife team find inspiration in technological innovation rather than dense theoretical concepts. Over the past weeks Marks and Barfield have been coming regularly down to Brighton to check the progress of their latest project, created together with French engineers who have made possible the architectural vision. Their son Ben, a recent architecture graduate, has also been brought to work on the project, and came down to Brighton with his parents. Marks seems excited to see this project close to completion. Earlier over the phone he explained what a long road it has been, which at times looked like it wasn’t going to happen. “Funding took a long time” he says and explains the complex arrangements, first with a pension fund and then the local council saw the potential for urban regeneration. Marks Barfield also made an investment, as they had previously with the London Eye. 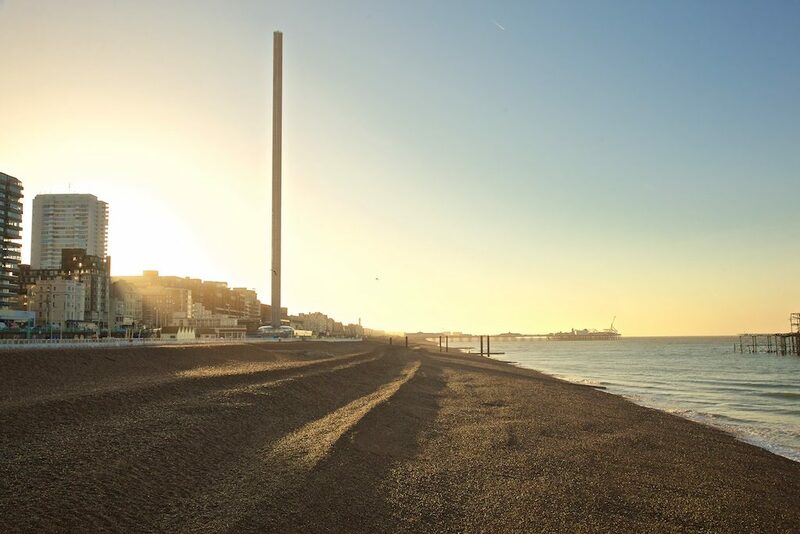 The i360 tower will be the slenderest structure of its kind ever built to such a height, and now it holds a spot in the Guinness Book of World Records. While the pod is on the ground level, the column is the only visible part. Barfield praises the expertise of their French engineering team and what can now be achieved with modern technology; so much more in comparison to when the London Eye was built, Barfield says. She is very pleased with the cabin design, which is made of thick double-glazed curved glass panels – and obviously will need to stand against all weather conditions on the seafront. The idea for a mirroring surface underneath the pod came from a sculpture by Anish Kapoor, Barfield explains. The rotating tower is a feat of engineering, which takes a surprisingly small footprint on the ground and boasts low energy features. Disappointingly the wind turbine has been replaced by a plain spire on the top, “it would have caused too much vibration” Marks explains. The tower will be a new architectural icon for Brighton for sure, attracting visitors and tourism, and an apt symbol for a city known as a hub for the creative tech industries.